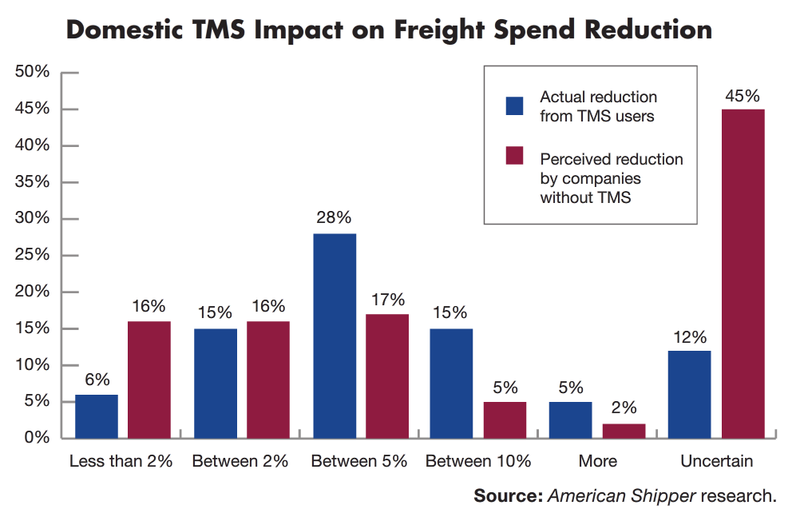 A recent American Shipper report on the subject of domestic TMS adoption by shippers in the US reveals that just shy of two thirds of US companies with more than $100 million in annual freight spend are using TMS systems to manage transportation. The same report shows that a whopping 58% of TMS users are yielding freight spend reductions between 2% and 10% – the largest segment (28%) capturing around 8% annual freight savings. With such significant savings potential, why are a majority of high volume domestic shippers still without a TMS in place? The short answer is also revealed in the American Shipper report which states, “Consistent with other American Shipper research into the barriers to IT investment, most respondents to this study cited the cost of TMS and lack of executive support as holding them back.” The report further (and rightly) concludes that this barrier to entry is not the result of any shortfall in the capabilities of leading TMS solutions. Rather it speaks to a lack of clarity in articulating the benefits of the system as they apply to users, suppliers and executives alike. The disconnect between what TMS is proven to accomplish and the perception of this value in the mind of those with purchasing authority can be bridged via an iron-clad business case. Visibility | TMS provides superior visibility into freight movements which means more responsive customer service for outbound loads to your customers as well as better manufacturing/production planning capabilities for inbound loads to your facilities. Productivity | Transportation staff redeployed from tasks associated with data entry and reconciliation of errors to more strategically relevant tasks associated with carrier relationship management and customer service. Performance | The collection of all transportation data in a TMS drives analytical capabilities in numerous areas from carrier performance to on-time delivery to dock door scheduling and dozens of other areas where having metrics helps improve transportation operations and efficacy. Cost Savings | Reining in unplanned freight spend, improved rating/routing, better planning for backhauls/continuous moves, better private fleet utilization, more accurate freight payment, and numerous other functions of a TMS yield impressive savings on freight spend. Moreover, today’s Cloud-Based TMS solutions require no hardware purchases and very little assistance from internal IT resources. Both these points are crucial to the cost arguments in your business case. Building the business case is a very different exercise for every organization as the contours of each shipper’s transportation network are unique. However, a reputable TMS provider has likely encountered a wide array of diverse network designs and relevant business processes. Don’t be averse to asking a prospective solution provider to help you produce a sound business case to present to executive and IT stakeholders.